Direct Stream Digital (DSD) is the digital format used by Sony in the Super Audio CD (SACD). But SACD is only one form in which it is used. I seem to remember that back in the day, Sony was promoting it as the best digital format for audio archiving. Something about robustness. Perhaps. But my problem with it is accuracy. Namely, it isn’t very, compared to the alternatives (ie: PCM). Recently I did a piece (should appear early 2012) for Australian HI-FI in which I explain how DSD works (single-bit pulse density modulation: the more 1s, the higher the wave form at that point), and how it terms of resolution it comes in around the same as PCM at 117.6kHz and 24 bits, or 141.12kHz and 20 bits. But Sony claims a ‘theoretical’ top end of 100kHz, which would imply a bit depth of just 14 bits! Fortunately, Sony uses noise shaping to move all the quantisation noise up to the HF area were it is less noticable. If you measure the output of an SACD player, you will find that the output of the signal, looked at by frequency, falls away from the audible band up to maybe 25,000 to 30,000 hertz, and then starts to rise again. 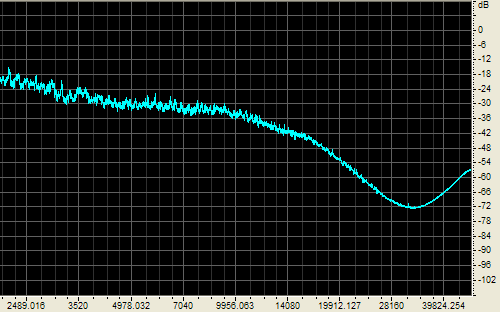 That rise is the level of HF noise DSD generates. I measured snippets from the analogue outputs of an SACD player for a few SACDs to illustrate the point. So far as I know, there are no tools to even play an SACD in a computer, let alone extract its digital content for direct analysis. However I have just been playing with the ‘Immersion’ box set for Pink Floyd’s ‘The Dark Side of the Moon’. One of the six discs contained therein is a Blu-ray which has three different versions of the album: the original 1973 mix in 2/0.0 (all are 24 bit, 96kHz PCM), the 1974 Quad mix in 2/2.0, and the 2003 5.1 mix in 3/2.1. As you can see, this is only shown from around 2kHz. The bottom of the dip — the point at which the ultrasonic noise inherent in DSD overwhelms the signal — is around 32kHz. Remember, the digital data being analysed here was carried on the disc in PCM format, which has no such problem. This is a DSD issue, and because the final mix was prepared in DSD, it carries through into PCM. I used different software, obviously, and note that this one is the full spectrum, but with a linear rather than logarithmic X-axis. Let me stress once again, had the mix been converted from analogue to PCM rather than analogue to DSD, then that rising noise would not have been there. As for an archival medium, what a dreadful choice! This entry was posted in Audio, Codecs, Music. Bookmark the permalink. There are now, legal and illegal tools tools to extract DSD data from SACD disks and there are a several DSD capable prosumer DACS on the market (Mytek DSD, Playback Designs etc) and a large number of people are happily listening to DSD files using computers from terabyte sized NAS. There are a number of online stores that sell DSD downloads (Blue Coast, E-Onkyo) and there are hundreds of native DSD recordings most in multi-channel released every year (http://www.sa-cd.net/dsd) and many analogue recordings are digitised to DSD (many using the outstanding Grimm A/D converter) for example Universal Japan has been releasing dozens of Analogue -> DSD transfers from the Deutsche Grammophone archives. Today Acoustic Sounds announced 50 Analogue recordings including mono releases on SACD using Analogue->DSD transfers. You can’t compare Pulse code modulation to Pulse width modulation, the data rate or information rate comparisons are completely meaningless.The quantisation noise is not audible due to human hearing, amplifier frequency response, and speaker frequency response. Practically most SACD players implement a steep rolloff filter at 50kHZ, and since this noise is 60-70 db down you cant hear it any ways. The main adavantage of DSD is its ability to reproduce the impulse response mimicking analog (see the chart here: http://www.merging.com/products/show?product=1&page=11. Also DSD recorders can now record at 128fs or 5.6Mhz which pushes the quantisation noise even higher. You have to accept that most multi bit Sigma delta DACS take your favoured PCM and turn it into DSD wide, 5 or 6 bit at multiples of 64fs. PCM’s downside is the steep antialiasing filter and pre and post ringing. Many people who like DSD are however also listening to DXD and consider them similar although even DXD’s impulse response falls short of DSD. As some one who has large quantities of high resolution native PCM and native DSD recordings, my clear preference is for DSD. I hope you cover all this off in your article. Thanks for the info on the DSD tools. Not a chance that I’ll cover all this in the article. In large part because it is already submitted, of course. But also, in large part because I find it hard to trust anyone’s ‘clear preference’ for one digital format over another, when all are of reasonable or better resolution. You note that the main advantage of DSD its impulse response ‘mimicking analog’. The link shows it producing a nice visual equivalent of a 3 microsecond analogue pulse (or click). I would love to create one of those to see if it is audible. I suppose it is. The mathematics of a true impulse suggests that it produces all frequencies at once. The question is, which of those frequencies can you hear? As you point out, ‘[T]he quantisation noise is not audible due to human hearing, amplifier frequency response, and speaker frequency response.’ Likewise, the very high frequencies within that impulse are not audible due to the same factors. Of course a 48kHz PCM sampling system isn’t going to capture this entirely. After all, 3 microseconds is rather shorter than the 20.8 microsecond interval for each sample in a 48kHz system. The ‘ringing’ you mention for PCM is primarily a visual artefact. It looks awful on charts, but as with quantisation noise, its actual manifestation is way, way too high in frequency to be audible. I should have been clearer, though. I like SACD as format. I object to it only on consumer information and theoretical grounds. Great impulses (of a kind which don’t exist in real music) do not for me outweigh the submerging of actual signal — inaudibly high though it might be — in a sea of noise. PCM does not do that. In the real world, though, there is no difference to how they sound. 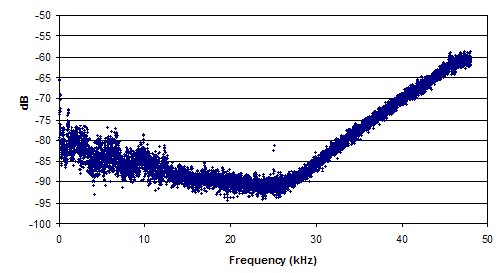 Yes, there’s more ultrasonic noise in 1 bit Sigma Delta (DSD) compared to multibit PCM. The payoff for this is much better impulse response which is why it sounds more natural. Look the graph at this link. Yeah, but ya gotta do somethin’!!! My PRIMARY MUSIC DELIVERY SYSTEM is my Iphone 4S (32GB). Sure, I’d like to kick back in my recliner and put on some slides because LPs produce 432bits (kinda sorta) per channel and you get that 3D soundstage & resolution that no Dithered Digitalized sound can (yet) reproduce. MY AUDIO GRAVE YARD: Systemdek IIx/ GyroMat/GyroClamp/Linn Basik Plus Arm/ Sumiko BPS cartridge for my LPs. Nakamichi DR3 for my MAXEL UDXL IIs Chrome Cassette Tapes, Pioneer XXXX for my Eight Track Tapes, Nakamichi for my DAT Tape, Adcom GDC575 for my CDs OPPO for my SACCDs, Compaq 6910p/Iphone 4S for my AIFF digital You Tube downloads as ported thru my FIIO E17 Portable DAC/ Headphone Amp. I have a SONY Beta Player, A NEC VHS player, an Toshiba HDDVD player, an OPPO for my DVDs, a Sony for my Blu Rays and XXXx for what other format I will be wasting space & money on. Michael, one of the nice things about the modern age is that you don’t really have to choose. Get a versatile piece of equipment and it will support all digital formats. Wait another year or two and the prices will come down. As it happens, the people who came up with the DSD, while probably not really of Einstein-like intelligence, were extremely competent and came up with a very clever, highly transparent system. The ultrasonic noise side of the things offends me on principle, but that shouldn’t take away from their achievement. Digital audio is mathematics. DSD uses some very smart maths. I think PCM works better, but that also is maths. If you are serious that LPs produce 432 bits, well you could be right. Just be aware that something like 420 of those bits are random and largely uncorrelated to the original signal. If you’re downloading AIFF I assume your laptop is a Mac. What music player are you using? Sit down and listen to your music already! DSD sounds amazing. Quit obsessing with your techie gear. Blackthorne, as it happens I am quite able to do both.